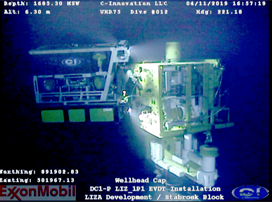 ExxonMobil has successfully installed the first subsea tree for the Liza Phase One Development Project. In a missive to the media, the company noted that a subsea tree monitors and controls the production of a subsea well. Fixed to the wellhead of a completed well, it can also manage fluids or gas injected into a well. The oil major said that the tree arrived in Guyana’s waters on the Chouest C-Installer in February. It said that installation and testing began on April 11 and lasted for four days. The American multinational said that it was lowered into the water from the back deck of the multipurpose installation vessel via a crane, set in 1700 metres of water onto the first completed well, latched, and locked into place using a Remote Operated Vehicle (ROV). The valves were then pressure tested. The next tree is expected to be installed in May, the company noted. Further to this, ExxonMobil said that the Liza Phase One development includes a subsea production system and a Floating Production Storage and Offloading (FPSO) vessel designed to have the capacity to process up to 120,000 barrels of oil per day from four subsea drill centres consisting of 17 wells, including eight producers, six water injectors, and three gas injectors.